Your kitchen is missing something. But, what exactly is it? Are you a lover of breads? If you like making your own breads then you need a roti maker stat! 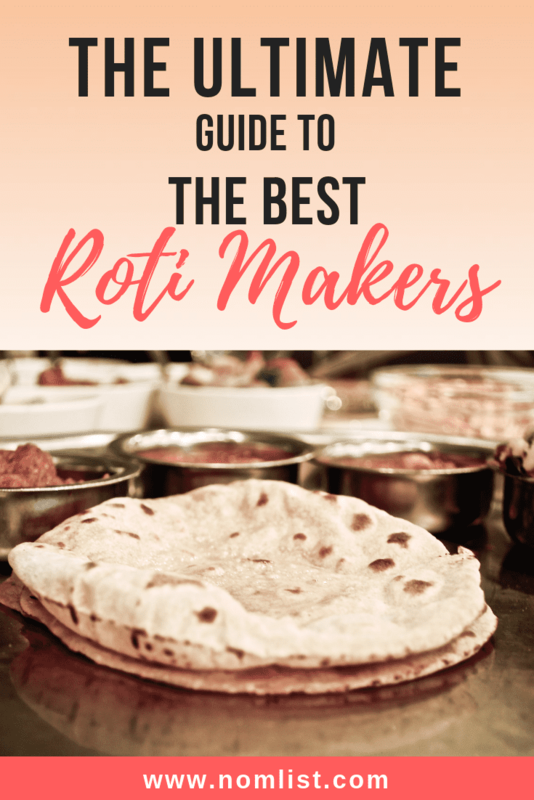 We wanted to create this ultimate guide to the best roti maker, so you do not have to scour the Internet in search of the one thing missing in your life. What is roti? You may have heard that roti is flatbread. That is true, but it is also a special kind. Roti is native to the Indian subcontinent. It is made from stone ground flour. Oftentimes, this type of specific flour is referred to as: atta. Various types of roti are also consumed throughout the West Indies. During meals, it is sometimes used to soak up yummy sauces. It can also be wrapped around food or eaten plain with honey! So, continue on down below and choose your favorite roti maker! We have a lot for you to choose from, so you can compare your options and pick the best one for you. This cast iron press by Victoria is being deemed the best overall roti maker. The cast iron comes pre-seasoned and is extremely durable. It has reinforced handle technology, for any easy to use gripping surface. This cast iron press can be used for tortillas, roti, empanadas and so much more! You will definitely get your use out of it and you don’t have to worry about what materials it is made out of. The iron is always seasoned at a high temperature with flaxseed oil. So, you can get right to cooking and not worry about what might be going into your family via your food. Lay your dough in the center and then lay the top part of the press onto the bottom part. You will not have to do much pressing, since it is so heavy. This cast iron makes roti consistently well and every flatbread looks uniform. The Brentwood is the perfect electric option for roti making. This exceptional model features stainless steel accessories. When it comes to cooking options, the Brentwood has got you covered compared to some other basic models. The heat is adjustable at the spin of a knob. This is very handy if you want to choose between soft or crispy roti. This model also features power and preheating indicator lights. The aluminum plates are nonstick. This means that they are essentially a breeze to clean. We always love it when cooking appliances make our lives a little easier. The great thing about the Brentwood is that it is not just limited to roti, and can press a variety of other foods as well. What’s not to love about this CucinaPro model? Roti making has never been this quick in easy and all you have to do is plug it in. Once plugged in, the Crepe Maker will heat up quickly. It’s plate is nonstick and there are five different heat options to choose from. There is an on and off indicator light. This will tell you when the griddle is hot enough to cook on. It also comes with a handy wooden roller to roll out your dough evenly so it cooks accordingly. This nice little electric griddle is perfect for roti, pancakes, and warming up tortillas. It also has little rubber feet on the bottom so it won’t be sliding around your countertop. This bread maker by Rosewill is revolutionary and requires very little work by you to make perfect bread every time. First, you will want to choose your loaf size. You can choose from two different options: one and a half pounds and two pounds. Then, you will want to choose how dark you want your crust. Are you swooning yet? The options you get for crust are light, medium, and dark. You can set a delay timer up to thirteen hours. But wait? Why is this bread machine in this ultimate list for the best roti makers? That’s because roti dough needs to be extremely soft. Not soft because of water that has been added, but because it has been kneaded for a long time. So, just pop in your roti dough and allow this machine to do the work for you. Located on top of the machine is a transparent window. Your roti has been pressed and cooked, but nobody has arrived to the party. Fear not! The Rosewill also has a feature that allows your roti to be kept warm for up to an hour. We just love the Oster Expressbake as an option for a roti maker for your home. It has a very sleek and modern outward design. It’s stainless steel interior is also quite durable. But, let us start with the brand. The Oster brand is dedicated to quality. Their brand promise is: “With the Oster brand you can cook with passion and serve with pleasure”. Their core values for their products are performance, versatility, and durability. The Expressbake is no exception. This automatic bread maker cranks out a two pound loaf of bread in under an hour. Just add your ingredients. The Expressbake has a kneading option, so you will not have to worry if your roti dough will be soft enough to create the perfect batch. The Expressbake does it all, from kneading to rising. It has an easy to read and use LCD screen. This screen also allows you to choose your crust type. This bread maker would be perfect for making roti for the whole family, as it holds a much larger capacity for roti dough. If you are looking for a heavy duty roti presser, then you have come to the right place. CucinaPro kitchen products are always top of the line and we are usually impressed by their quality and attention to detail. This a brand you can trust around your kitchen. The aluminum body of this tortilla maker, that is perfect for roti, is very durable and will last you for many years to come. The nonstick plates are a breeze to clean up and distribute heat evenly. This model is electric, but the cord is not big and bulky like we have seen in some other models of roti makers. This product by CucinaPro lives up to their quality standards. You can expect to be using this product years after your initial purchase. We love this model roti presser because it is electric, heavy duty, and makes perfectly round pressed every single time. Maybe you are not a fan of the electric presses. Maybe you want to make roti more of the old fashioned way. Maybe you are just intrigued by the wooden roti maker. Whichever the case may be, Starnk has a beautiful rounded wooden roti maker up for grabs and we are in love. The pure sheesham wood is just gorgeous and would look lovely in any home. It features three wooden non slip feet attached to the bottom. This will prevent the board from moving while you are rolling out dough. This wooden board comes with a wooden rolling pin that is also made out of sheesham. The handles at the end of the pin were crafted so that they are comfortable to hold in your hand. You would not want your hand hurting in the middle of you rolling! Use this wooden board to make roti right in your home. Hamilton Beach products are always found in our best product lists. This is for a good reason. Out of all the brands we have listed, you have probably most heard of Hamilton Beach. Their innovative kitchen appliances are creatively and thoughtfully created and tweaked, while always keeping the consumer in mind. This model is the Artisan Dough & Bread Maker, making your life a million times easier. All you have to do is add ingredients, choose a cycle, and push the button to start it up. It is that easy! This machine will mix the ingredients and knead the dough for you. It has fourteen different programmed settings for all different kinds of breads and doughs. There are three different loaf sizes and three different crust options. Experience the best in roti dough making when all your ingredients are mixed for you and the dough no longer needs to be kneaded by hand. Soft roti dough every time! It’s stainless steel interior makes clean up a breeze. This amazing roti Maker is perfect for a business. When it comes to professionalism and quality, we have never seen anything like it. It is manual and works with low to medium production rates. This press does not require electricity. If you have always used an electric griddle or a hand roller to make your roti, this manual press might be a nice alternative to try. Your dough will come out even and perfectly rounded every time. It’s easy and safe to use. Simply place the dough ball in the center and pull down on the lever. This will press the two stainless steel plates together. Ultra is a brand that is sweeping the kitchen department. They are known for having products that are aesthetically pleasing, but also are practical and inventive. It has a sturdy and durable motor. You may be thinking, “Well, if it has a motor it must be noisy”. That is actually not the case! This product is virtually noise free and does not vibrate. Are you looking for a product that really takes your batter to the next level? Kneading roti dough by hand can be time consuming and even painful at times. This dough takes work! These patented grinding stones will do all the work for you. The drum is easy to remove and can be cleaned easily. If you want a product that can almost do it all, then check out the Ultra Dura Wet Grinder. Food brings people together! If you do not know how to make roti from scratch, it is okay! The only manual roti maker, the wooden one, on this list is the one that requires you to work for it. All the other models will do most of the hard stuff for you. So, the next time you are thinking about roti, come to this list and see how different in varieties each maker is. Before you begin your search, decide what you want in your roti maker and make a list of must have features.